African Americans 4 Edition A compelling story of agency, survival, struggle and triumph over adversity. This text illuminates the central place of African Americans in U.S. history by telling the story of what it has meant to be black in America and how African-American history is inseparably woven into the greater context of American history. African Americans draws on recent research to present black history within broad social, cultural and political frameworks. From Africa to the 21st century, this book follows the long turbulent journey of African Americans, the rich culture they have nurtured throughout their history and the quest for freedom through which African Americans have sought to counter oppression and racism. This text also recognizes the diversity within the African-American sphere, providing coverage of class and gender and balancing the lives of ordinary men and women with accounts of black leaders. Note: MyHistoryLab does not come automatically packaged with this text. 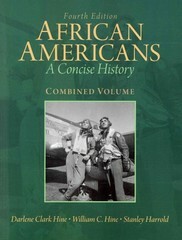 To purchase MyHistoryLab at no extra charge, please visit www.MyHistoryLab.com or use ISBN: 9780205090754.